Breakfast was amazing, more than I thought it was going to be. Balcony beautiful! Room 21, royal room, was perfect. Felt the ocean breeze all day. Never missed the A.C. Steps from the beach. Perfect. Great value for the money compared to the other boutique hotels. The hotel room was clean ,large and well maintained . The staff is kind and does not go too much in your way, just enough as interaction with guests. Everything, the priority was beautiful and the staff was friendly and helpful. Beautiful setting right in the beach. Pleasant staff. Breakfast included. Small and intimate. Location is amazing! You will be close to everything. We stayed on the Junior Suite and it was incredible. Really beautiful view, A LOT OF SPACE and we never missed the AC. So totally worth it. I love the location and the staff are extremely helpful and polite. Hotel is located on a busy street next to many cool restaurants and bars. 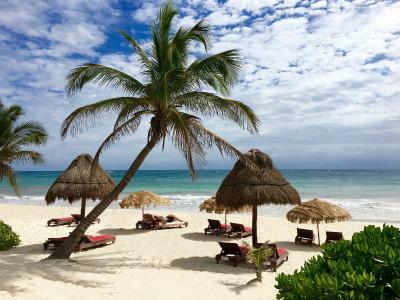 Hotel Calaluna Tulum-Adults Oriented This rating is a reflection of how the property compares to the industry standard when it comes to price, facilities and services available. It's based on a self-evaluation by the property. Use this rating to help choose your stay! One of our best sellers in Tulum! 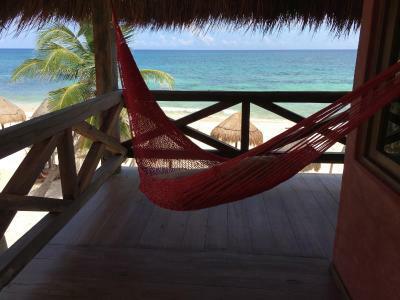 Offering a private beach area, Hotel Calaluna Tulum is located in Tulum. Free WiFi access is available. Featuring a shower, private bathroom also comes with free toiletries. Extras include a safety deposit box and a fan. At Hotel Calaluna Tulum you will find a 24-hour front desk and a garden. Other facilities offered at the property include a ticket service, a tour desk and luggage storage. The hotel is 2.8 mi from Tulum Archaeological Site, 1,950 feet from Parque Nacional Tulum and 2.5 mi from Tulum Bus station. Cancún International Airport is 116 kms away from the property. Please note this is an adults only hotel. 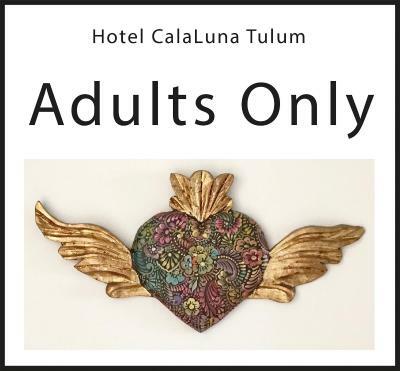 When would you like to stay at Hotel Calaluna Tulum-Adults Oriented? This Oceanfront room features a terrace facing the Caribbean Sea. This room have a 2 beds, 1 King-size on the 1 floor and 1 queen-size on the second floor, sea view, 1 bathroom with shower and a large patio. This rooms, different from each other, can be found on the ground floor or first floor, palapa roof or not. All with private balcony or patio and sea view. The room is located at the entrance of the hotel, above the reception, it has a queen size bed and a small garden view terrace over the reception, it is on the side of the street. This room is located across the street, on the jungle side, in a separate building. It is located on the 1st floor and is spacious. There is a private bathroom with a king-size bed and a large balcony with views of the jungle. House Rules Hotel Calaluna Tulum-Adults Oriented takes special requests – add in the next step! Hotel Calaluna Tulum-Adults Oriented accepts these cards and reserves the right to temporarily hold an amount prior to arrival. The hotel can charge the reservation total any moment within the 20 day period prior to check-in date. I have nothing to complain about the property. I loved my stay there! The location was perfect. We had a room with a view at the sea and palm trees. There were a lot of nice restaurants in the area, so it was not a problem to find a place for dinner. There was a choice of 5 different meals for breakfast which was served every day. There was also a private beach for guests. Well everything was pretty awesome!It is hard to tell if something was bad! Maybe the water pressure or the little mirror in the bathroom but those are just things that need to be improved! Great spot in general! Excellent! Only complaint bis it is next to road so it is load, other than that I will be here again! The staff at the front disk who assisted us during the check-in wasn’t friendly, we felt unwelcomed and if she was bothered to do her job. Although she did speak English well, she didn’t provide me with any information about my stay in the hotel and the hotel’s facilities. The room wasn’t very clean, there was big ants filling the place. My room was very noisy. Really friendly staff, great location and right on the beach. Breakfast was fresh daily. Room had very low light at night so hard to find things. Would be nice to have dimmer switch. Lots of ants inside around near the bed. Really expensive for the style and type of accommodation. In fact the area, restaurants and bars were all overpriced. Prefer the Pacific coast of Mexico in future. Half the price! Close to beach. Cute, rustic accommodation. Huts are like being on Gilliagan's Island. Staff were helpfull and friendly. English was good. There was no much beach to speak of and the little bit of beach, was mostly covered with seaweed. Very nice and comfortable room. Breakfast was extremely poor. I'm not a picky person but I will love to have at least a few choices of bread not from a plastic bag fresh, some bake goods as croissants ,scones and maybe one more kind of fresh juice . I'm comparing with all the other hotels I've been in Tulum in the past 5 years and this one so far has the most poor choice for the price it does charge per room. There is a walkway to the beach which seems to be used by alot of travellers, hostellers who tend to set up right in front of the hotel, it is OK as long as they do not bring loud music and voices with them. 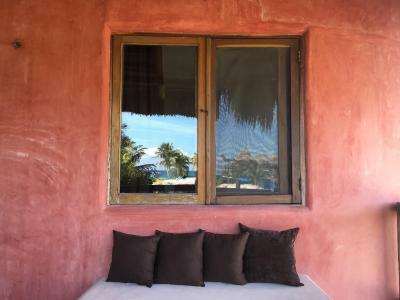 As far as the price for staying right on the beach in Tulum the price is excellent. The breakfast included is very good and sufficient. Although the restaurant only serves breakfadt there are a number of places for all meals and happy hours within walking distance. The beach is small but beautiful. No hotel bar. Ants all over the room. Generator went out twice. As far as security goes I didn’t feel unsafe but absolutely anyone could walk up and crawl through a window right into my room with minimal effort. Breakfast was okay, only three options to choose from. Ended up eating most mornings at a little cafe right across the street. I was there for 7 nights. Hotel ended up charging me extra at the end for my friends coming to the beach and using the bathroom in my room. Told me they were “watching me” and that the room was booked for two people not three and my 2 friends who were staying in town spent one night in my room because it was 4 in the morning and too drunk to ride their bikes back to town. So they sprung an extra charge “must pay in US dollars” on me while I was checking out. I asked why they hadn’t mentioned during the 8 days i was there that my 2 friends couldn’t use the bathroom in my room and no answer.